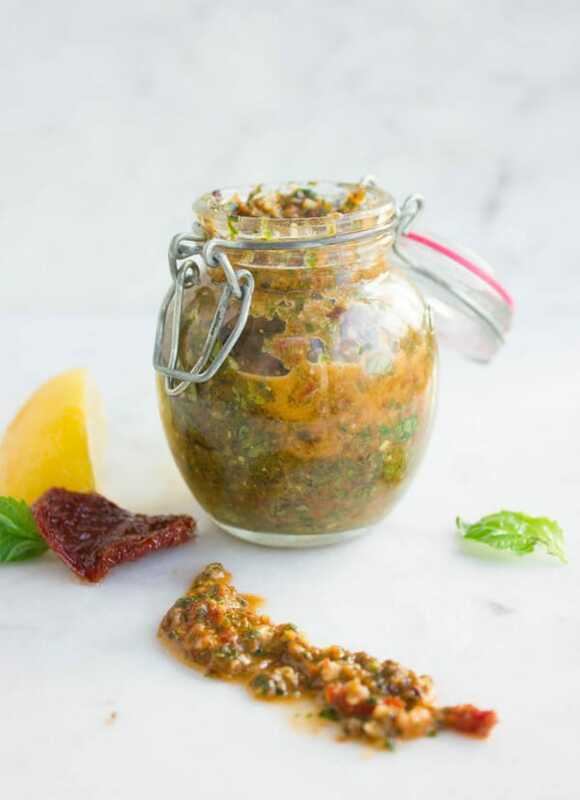 5 Minutes is all you need to make this homemade Sun-Dried Tomato Pesto in your food processor. Perfect with pasta or in a pasta salad, as a topping for chicken or served as a creamy pesto dip! This Sun-Dried Tomato Pesto recipe is an absolutely addictive one that you can use on so many different dishes. It’s perfect on its own tossed with pasta or served as a pasta salad, slathered on grilled chicken, fish and meat, as a spread on sandwiches and burgers and much more. The flavor of sun-dried tomatoes is enhanced by the addition of herbs, scallions, lemon and garlic, then processed until with walnuts and olive oil. 5 minutes and a food processor is all you need! 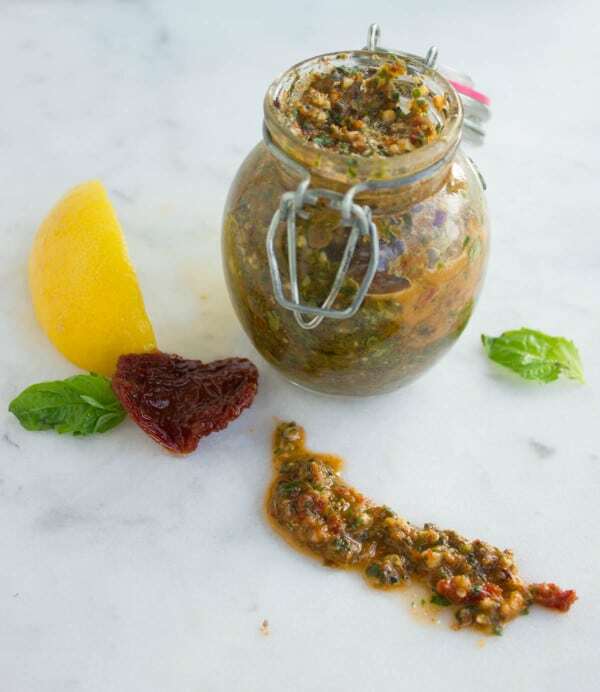 I am an absolute fan of pestos in general, and this Sun-Dried Tomato Pesto in particular. It’s an obsession almost, and it’s one I can’t hide. 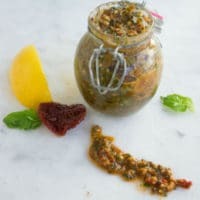 You will love this recipe for Sun-Dried Tomatoes Pesto because it comes together in 5 minutes and you can throw in many different ingredients and end up with endless varieties of pestos. And what do I do with all those homemade pestos you may ask? Well, on a rushed day, I’ll boil some spaghetti, toss it with a type of pesto and have a fabulous dish ready in 10 minutes! 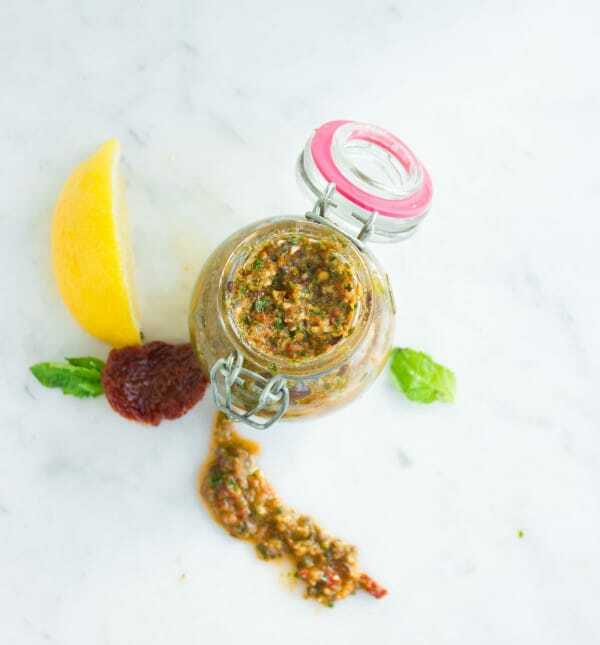 This sun-dried tomato pesto goes especially well with chicken! If you have no time to marinate chicken, beef or fish—I’ll cook or grill them and then smear a thin layer of pesto on top for a fabulous boost of flavor! Another favourite is a smear of Sun-Dried Tomato Pesto on my sandwiches and burgers. I also love to flavor or make my salad dressings with homemade pestos—by simply taking a teaspoon of pesto and diluting it with a type of vinegar, a little more olive oil and sometimes mustard and, or, mayo. For a quick snack, you can make a creamy pesto dip out of pesto by adding a 1:2 ratio of pesto to cream cheese (or sour cream or a combo of both). The beauty of homemade pesto is that you can store it in the fridge for up to 1 month. Then if you’re ever rushed on time, the first thing you’ll reach for will be your pesto jar with Creamy Sun-Dried Tomato Pesto! The perfect condiment to turn any simple dinner into a Mediterranean meal! The recipe for this creamy homemade pesto is SIMPLE! Add all the ingredients apart from olive oil and lemon juice to your food processor and pulse until a coarse paste forms. Add the olive oil and lemon juice and process until smooth. I love making this Sun-Dried Tomato Pesto and I know you’ll love it as well! I think it’s the tomato garlic basil Parmesan combination that is so familiar and brings a level of comfort to our food, then comes the walnut, scallions, and lemon to spike the flavors and make it a little more intriguing. 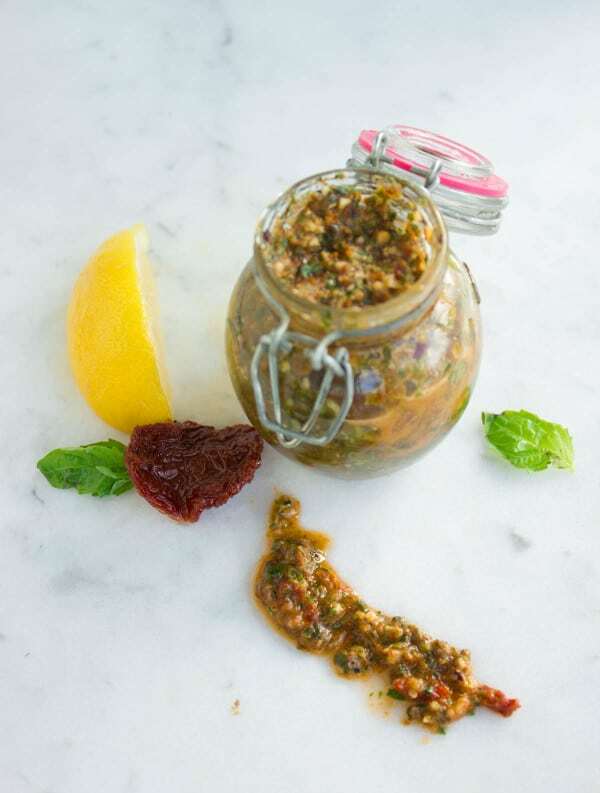 Feel free to try this homemade pesto recipe with kalamata olives, oregano, and a few capers. You can store your Sun-Dried Tomato pesto in the fridge for up to a month. Another fabulous recipe I love using this creamy Italian pesto for is in my pesto stuffed shrimps recipe! In a food processor, add sun-dried tomato, garlic, scallions, basil, parsley, walnuts, seasonings, Parmesan and pulse until mixture forms into a coarse paste. Add the olive oil and lemon juice and process until it forms a pesto as chunky or smooth as you prefer the texture to be. Store the pesto in the fridge for up to 1 month.